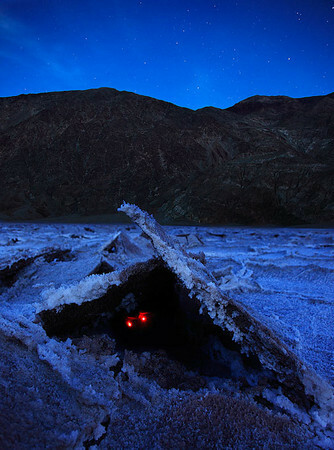 Ever been to the salt flats in Death Valley and wondered what in the world could live in such a place? Here is a story I won’t forget. While photographing the hexigon patterns in the golden hour as usual it soon became dark and I found these uplifted salt tiles stacked up higher than I’d seen before maybe 2 1/2 ft or higer. While getting a more intimate view, there it was starring me down with those eyes that don’t lie, as I got closer and closer they began to take on an unearthy evil red GLOW! By this time my thumb had already depressed the cable release. I only managed to snap the shutter once before it let out it’s high pitched shrill and charged me. It was so loud by the time the gesture was made to cover my ears, I was knocked over and the air was filled with goose feathers falling like snow flakes on the salty crystal floor. Then in the almost complete darkness the real panic began, my head lamp must have fallen off my head in all the commotion, I didn’t know if “it” got me or not.. . I frantically rummeged the uneven floor trying to find the lamp, I couldn’t find it. My facebooking, twittering, blogging I-phone lit up the darkness and I could see that I was saved by a mere layer of clothing, my down jacket. It all happened so fast all I could remember was a giant pair of buck teeth glisten in the darkness of night. Mom always knows best, put on your jacket it’s cold out there, little did she know it could save a person from a little more than the cold. The following post has info on wild flowers just outside of Los Angeles, you could be back home in time Easter! This entry was posted on April 1, 2010 at 10:36 am and is filed under Uncategorized. You can follow any responses to this entry through the RSS 2.0 feed. You can leave a response, or trackback from your own site. Lol. I needed that chuckle today! Thanks Steve! Very funny and a cool picture to boot. That could be a book cover! Oh my god, goose feathers in the air. You crack me up! What would it be like to be inside that head of yours Steve? I can’t believe the government wants us to think they aren’t real. Great red-eye photo. I’ve seen it’s larger cousin the red eyed three feet apart “snort,snort”. Judging from the attack you’re lucky it didn’t get you by the throat and just savaged your coat. You need to carry a couple of the ” Holy hand grenades of Antioch.” for protection in the future these beasties are more common than you think.